Foundation Gut Enhancement is a uniquely designed protein powder enhanced with amazing health benefits. This medical food grade formula contains powerful ingredients to support gastrointestinal health, increase detoxification, and fight inflammation. Foundation Gut Enhancement is an innovative functional food designed to rebuild the gut and provide nutritional support for the body to fight inflammation, support gastrointestinal health and eliminate toxins out of the body. 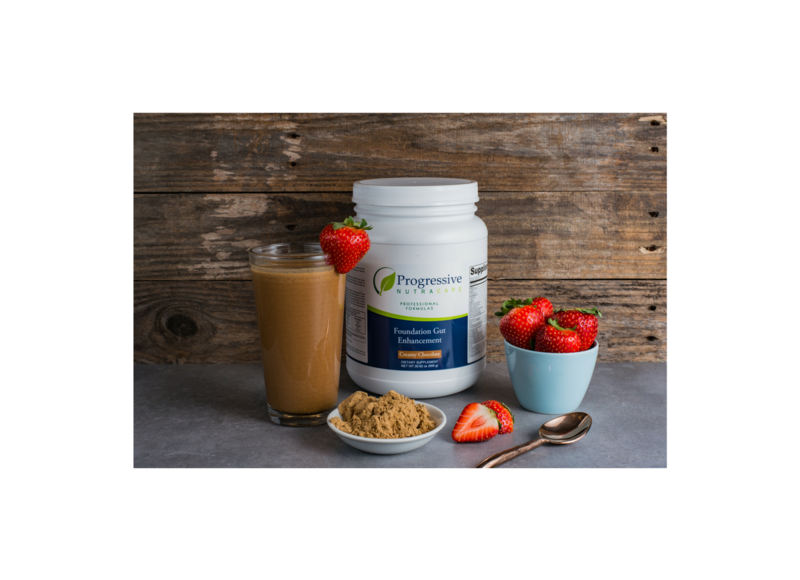 This all-natural, fructose-free formula includes ingredients that promote overall intestinal health including minerals, vitamins, complete amino acid profile and proteins that also enhance optimal health. Foundation Gut Enhancement's high protein level and great tasting formula contains all of the essential amino acids with high amounts of glutamine useful for treating leaky gut. While providing the best in gastrointestinal health, this medicinal food also serves as a breakfast replacement shake and has been used to assist with weight loss goals. Your gut is essentially the foundation of your body that performs so many functions. Oftentimes these functions can be disrupted with a poor diet, overuse of medications, and environmental toxicity. This leaves your gut not functioning properly and resulting in some chronic health issues. Foundation gut includes essential nutrients to support gut health such as ginger, meadowpure, and glutamine. Ginger is a component to aid in digestion and ease bloating and gas. Meadowpure is a combination of flax seeds to provide fiber for gut motility and also create healthy intestinal flora. Glutamine is an essential amino acid that serves as an anti-inflammatory to heal your intestinal lining. Our detox pathways are designed to release toxins out of our body for optimal health. Our bodies often need support performing this task as so many disruptors can get in the way. These disruptors include food intolerances, chemicals in products, environmental toxins and even from water. Foundation gut contains nutrients designed to increase detoxification. Watercress is added to help those pathways by moving toxins out of your system. Green tea not only supports those phase I and phase II detox pathways but it is also a great antioxidant as well. Choline is a macronutrient present to help with metabolism in the liver but also helps with energy levels and maintaining a healthy metabolism. Inflammation is unfortunately a common thing that everyone is fighting. It is the root cause of the most common diseases. The source of inflammation can show up in so many different places in our body. We can experience anything from digestive disturbances, headaches, anxiety/depression, joint pain, etc. Foundation gut contains powerful natural anti- inflammatories to assist in healing these s ailments. Curcumin is a powerful nutrient that helps to control inflammation and is believed to be the most effective anti-inflammatory in the world. N-acetyl-cysteine is an important building block of glutathione, which is crucial for fighting inflammation, and is also important to boost immunity. Selenium glycinate is a vital mineral that increases immunity and aides in inflammation by fighting against free radical damage. With Progressive Nutracare’s Foundation Gut you can be confident in its wholesome, quality ingredients. Our ingredients are sourced from a GMP certified manufacturer that leaves out unnecessary fillers and sugars that you would find in most other protein powders on the market. We do outside testing to insure there are no allergens. Foundation gut can accommodate any diet whether it be soy free, sugar free, gluten free or vegan. Start including Foundation Gut in your daily routine so you can experience the amazing benefits it has to offer! VegaPro is a key ingredient for improved intestinal function, supporting metabolism and weight loss. VegaPro is a proprietary blend of pea and rice protein concentrate that contain therapeutic amounts of glycine, taurine and L-glutamine, is easily digestible and gluten free. The balance of essential amino acids support metabolism and lean body mass as well as enhancing digestion and absorption of protein which is essential for cellular activity and brain function. Ginger Root plays an important role offering support for the GI tract and digestion, immune system, antioxidant activity, and and supports the body’s normal response to fight inflammation. Ginger has been used for centuries to assist as an antiseptic, laxative, tonic and stimulant. Another benefit of ginger root is to support the gallbladder in releasing bile which assists in digestion. Ginger has anti-inflammatory properties helping to reduce swelling systematically, reduces muscle aches, reduce cholesterol levels, and fight free radical damage. MeadowPure is essential to promotes antioxidant activity, as well as proving soluble fiber, lignins and essential fatty acids. MeadowPure is an organic , full-fat, non-GMO, milled golden flaxseed complex. MeadowPure has shown to support healthy hormone metabolism, detoxification, antioxidant mechanisms, and maintenance of normal lipid and glucose levels. MeadowPure is also a source of the essential omega-3 fatty acid alpha-linolenic acid, as well as soluble fiber, vitamins, minerals, and the essential omega-6 fatty acid, linoleic acid. L-Glutamine is necessary for many metabolic functions and is the most abundant amino acid in the body making up 50% of all amino acids in the blood and 60% in the body. Glutamine plays a key role in healthy intestinal cellular health and gut barrier integrity helping to support immune function, neurotransmitter production, lean muscle integrity and tissue healing. Glutamine is primarily stored in the muscle and during times of stress such as illness, injury, surgery, prolonged exercise or environmental stress, glutamine is released into the bloodstream to be transported to tissues needing support throughout the body. Chronic depletion from stressors makes supplementation necessary. Ellagic Acid is made from pomegranate extract and supports the bodies use of glutamine as well as binding directly to toxins and protecting DNA. Watercress Powder is essential for detoxification through excretion of toxins. Watercress Powder is a natural anti-inflammatory and is useful for skin issues and contributes to healthy skin. Watercress is considered a liver tonic and was used by Greek and Persian soldiers to increase stamina and improve health. Watercress also contains glucosinolates that is metabolized by gut flora and acts as a selective inhibitor or inducer of enzymes during the detoxification process. Green Tea Catechins are essential to support antioxidant activity and assist with detoxification. Green tea catechins also contain antioxidants and also bind to toxic substances performing dual functions during detoxification. Choline supports lipid metabolism in the liver. B Vitamins B6 and B12 as well as glycine all support amino acids and are vital for detoxification. MSM / Methylsulfonylmethane is important for helping to fight inflammation and promotes detoxification by dissolving compounds and supporting the body’s methylation process of eliminating toxins. MSM is an excellent source of sulfur needed by the body for healthy skin, hair, nails and joints. MSM benefits joint tissue by delivering sulphur which helps to maintain the strength and structure of connective tissue within the joint. MSM has also been shown to reduce joint tissue damage caused by free radicals. Bioflavonoids, Quercetin, Rutin, and Curcumin all support antioxidant activity, counter the damaging effects of free radicals and support metabolism. NAC / N-Acetyl-L-Cysteine is critical because it is one of the most important antioxidants in the body and protects cell and tissue health and helping to rid the body of metal toxins and also supports the body’s glutathione production. NAC restores the liver’s normal levels of glutathione, which is the brain’s most important antioxidant and has been shown to reduce the formation of free radicals that can contribute to oxidative damage to the brain. NAC also helps to heal damage of the liver and also helps to breakdown large amounts of mucus supporting respiratory and eye health. Both glutathione and NAC help reduce the viscosity of the mucus allowing for clearing of the airways and improved respiratory health. NAC also protects the kidneys by reducing kidney related toxicity. Foundation Gut Enhancement is a medicinal food that promotes overall intestinal health and supports the body in detoxification. Foundation Gut Enhancement is for someone looking to repair the intestinal wall, reduce inflammation, increase immune function, increase neurotransmitters and support their weight loss goals. Foundation Gut Enhancement is intended to consume 1 to 2x daily or as directed by your healthcare practitioners. Blend, shake or briskly stir 2 level scoops (49 g) into 8-12 oz of chilled water. Can also be used as a smoothie mixed with coconut, almond or other milk substitutions, fruits and vegetables blended as desired. Adjust the amount of liquid to your personal level of sweetness and thickness. Best results will be obtained when combining with a modified elimination diet. I have to watch my sugar intake and this shake has no sugar or stevia but tastes great. I add coconut oil and Greens First to make it more healthier and it keeps me full for over 4 hours. I also have IBS, and this has helped me control my symptoms. I highly recommend this to anyone looking for a sugar free and vegan protein shake. It tastes good. I drink with Almond milk or coconut milk . Stomach hasnt bloated with it and my energy is back. Its acutally helping my gut issue in such a short amount of time . I will rate it 5 stars. Wish I started this years ago.